According to the American Water Works Association, average daily residential water use in the United States is 27.4 billion gallons. This domestic water is used for everything from lawn irrigation to cooking, cleaning and plumbing. By that account, it’s clear that water is essential to homeowners who take great pride in maintaining and improving their homes. A consistent supply of water requires reputable, reliable and high quality pumps. Xylem’s Goulds Water Technology (GWT) brand pumps are engineered, tested and assembled to meet these homeowner needs with pride in craftsmanship. Xylem’s passion for solving domestic water challenges begins with innovative pump concepts, design and engineering work at the company’s facility in Seneca Falls, New York. As part of the design process, engineers explore virtually every possible use of these highly technical devices. Using 3-D software and advanced CAD simulations, they examine how the pumps will behave in scenarios ranging from normal everyday domestic water use, to rare or extreme water-related situations, as in the event of a drought that causes dry running conditions, or from abrasives such as sand. Additionally, expertise in residential applications, including water pressure, wastewater and irrigation, enables Xylem engineers to design GWT pumps to last for decades with progressive technologies. Materials, such as cast iron, engineered composites and stainless steel ensure exceptional durability over time. Prototyping supports identification of design enhancements that address considerations ranging from geography and climate, to adverse system conditions. 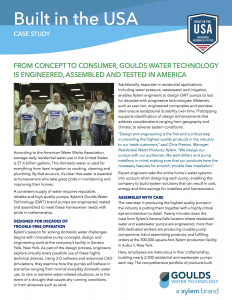 Expert engineers take the entire home’s water systems into account when designing each pump, enabling the company to build system solutions that can result in cost, energy and time savings for installers and homeowners. The next step in producing the highest quality pumps in the industry is putting them together with a highly critical eye and attention to detail. Twenty minutes down the road from Xylem’s Seneca Falls location where residential water and wastewater pumps are engineered, more than 200 dedicated workers are producing durable pump components, hand-assembling products, and fulfilling orders at the 300,000-square-foot Xylem production facility in Auburn, New York. Here, employees are meticulous in their craftsmanship, building nearly 2,500 residential and wastewater pumps each day. The comprehensive portfolio of products built here include 4-inch and 6-inch submersible pumps, jet pumps, sump, effluent and sewage pumps, prepackaged systems, multi-stage and end suction pumps, and a host of other accessories and controls. The facility itself is designed and equipped to ensure high product quality and reliability. In fact, Xylem’s Auburn plant recently completed a three-year Lean Transformation program, minimizing errors in production, creating a safer work environment, and supporting some of the best on time performance and delivery to lead times in the industry. This relentless attention to detail was also a primary factor in earning the facility ISO-9001 certification, which further sets the global water technology leader apart from its competitors. Xylem and its employees exhibit as much care and consideration in the final stages of assembly, as they do throughout the rest of the production process. Pumps are packaged and shipped with attention to product presentation and durability to ensure a positive unboxing experience for customers. Precise assembly is followed by rigorous performance testing, an integral part of the production process for all GWT pumps. Every pump is hydraulically and electrically tested to Xylem’s industry-leading safety and performance standards. The company’s commitment to quality leaves nothing to chance during production. Take GWT 4-inch submersible pumps, which go through two test cycles. First, the pump is tested for liquid end hydraulic performance in accordance with Hydraulic Institute standards. This involves submerging the pump in water, connecting the pipe and wiring and then running the product to assess performance. Then, the motor undergoes an electrical test where electrical characteristics (i.e., watts) are confirmed and verified a second time to the published performance. By the time these products are ready for market, many have undergone more than 1 million testing cycles comprising factors such as mechanical strength, durability, hydraulic validation and electrical checks in the Xylem lab, located in Seneca Falls, New York. Each motor and pump receives a bar code containing information from the test process. 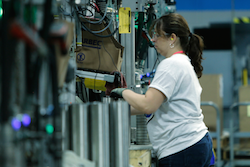 By coding the motors and pumps, plant workers can guarantee they match during assembly. Labels, serial number tracking and production records for each unit identify which assembly line produced it and which operator assembled it. To ensure quality of the final product, the data matrix label – which includes the model and serial numbers, test performance data, date and time stamp – doesn’t print unless both pump and motor pass their tests. This process, currently used for the production of the 4-inch submersible pumps, is important because it enables the installer to scan the product and understand how it is going to perform before they invest time and money to install it. 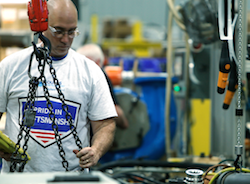 “A great sense of pride and responsibility comes with knowing that each product can be traced to its origins and was assembled here in the U.S.,” said Foster. Xylem’s superior performance and quality testing are matched by the company’s training and educational offering for the residential and wastewater market. The Seneca Falls facility hosts the Campbell Education Center and laboratory, which has educated thousands of people about Goulds Water Technology products and taught troubleshooting techniques for more than 30 years. The GWT Factory School, as it’s called, was revamped in 2012, providing distributors, dealers, engineers and other industry professionals with hands-on exposure to the latest pumping technologies, and a suite of courses that span the GWT product line and related systems. The lab comprises mobile demonstration units, network and Wi-Fi enabled equipment, LED TVs and configurable work stations for real-world experience in residentialSTUDY and wastewater pump systems. Complementary to the interactive lab environment is practical education in the classroom outfitted with smart technology. Tyler Sutliff, president of Whisenant & Lyle, agrees. “We are learning about technology that we’re using now as well as technology coming online in the future. Xylem is keenly focused on helping support our business, which, in turns, helps us grow our business,” Sutliff said. From concept and engineering to assembly, testing and installation, GWT products continue to be produced with the conscientious pride of a workforce dedicated to quality, the credibility of a 150-year old company, and the high reliability of components and processes critical to ensuring an excellent pump ownership experience.